Dinner & Tournament Features Feast & Fun Throughout North America! 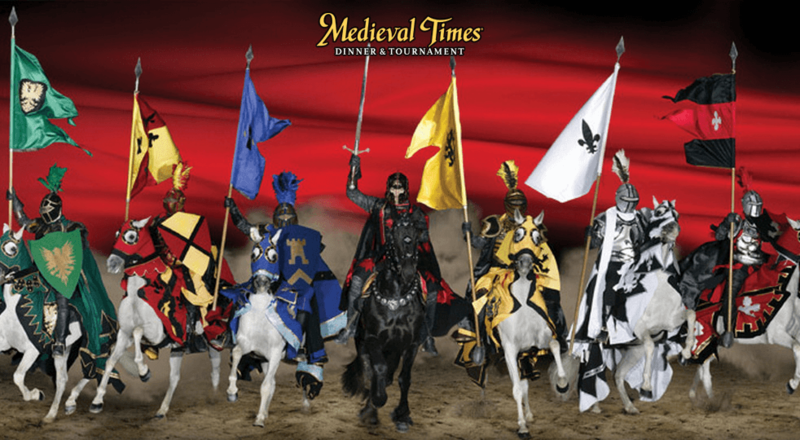 Over the years, Medieval Times Dinner & Tournament has become an iconic part of American culture, and with 9 locations spread across the United States it can offer a great experience to build your next vacation around, regardless of the area you're looking to escape to. Whether the East coast, West coast, Midwest, down south and even in Canada, you're sure to find a Medieval Times. The show offers guests an immersive tale of the Middle Ages complete with hearty meal and exciting action. As the story goes, you have been invited to a royal banquet hosted by the king of the realm. The banquet's entertainment features six of the king's bravest knights in a competition of skills, with the winner taking the hand of the lovely princess. Throughout the night, you'll find skilled horse-riding competitions, intense jousting matches and action-packed hand-to-hand combat for a lively, and fast-paced time of entertainment. And to add to the immersive nature, each section of the theater is designated a knight to cheer on, offering a competitive spirit to the night. As for the meal, you'll find a royal feast complete with garlic bread, hot vegetable soup, roasted chicken, spare ribs, seasoned potato and a pastry, as well as your choice of two soda or two beers. Tickets & Vacation Packages with lodging are available by clicking the links above or by calling 1-800-987-9852.